TORONTO — Wilson Ramos does not feel 100 percent, he said Sunday. His hamstrings are ailing. His left wrist is still sore. But he drove in three runs in a 8-3 win over the Blue Jays. Ramos has been the Phillies' hottest hitter since he joined the team Aug. 15. And that is what makes his health a predicament. Sunday was just his sixth game. The Phillies want to ride Ramos as much as they can during the season's final five weeks. They also must monitor his health to avoid burning him out. "We'd love to ride him. We'd like to play him four times, five times a week if possible. A lot of that depends on how well he's recovering so we don't get overzealous and put him at risk in any way," manager Gabe Kapler said. "Kind of like we did at the very beginning of the season, we're balancing winning today's baseball game with the long-term health and well-being of our players. In this particular case with Ramos, it's balancing winning tomorrow with having him healthy through September and into October." Ramos went 4 for 5 with a two-run homer Sunday. The most impressive thing, Rhys Hoskins said, is that everything Ramos hits seems to be hit hard. He has 12 hits in his first 25 at-bats with the Phillies but he has missed as many games — six — as he has played. 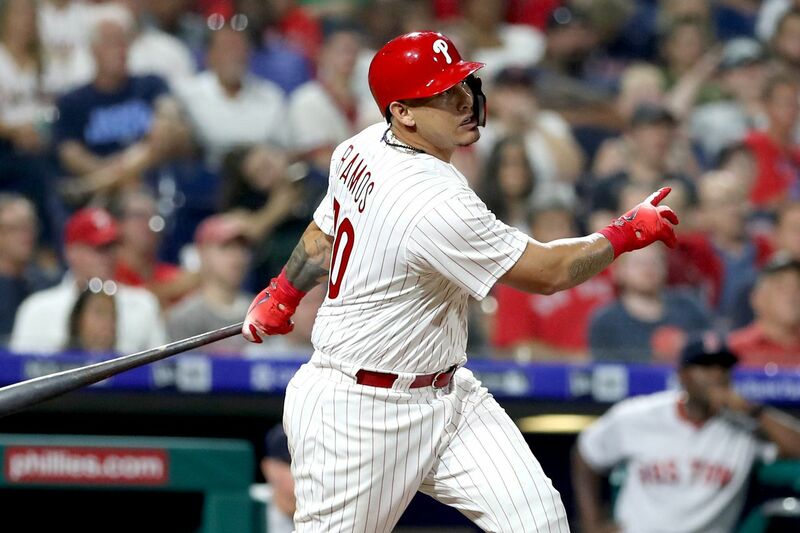 The catcher came to the team with a left hamstring injury and the Phillies monitored that, but then Ramos became bothered with a sore right hamstring because his body was not balanced from his left hamstring injury. He added a left-wrist injury last weekend when he was catching. There is a clear difference when Ramos is in the lineup. That much was clear on Sunday after he missed the first two games in Toronto. The Phillies have to find a way to keep him in it as much as possible. "I want to play. I want to play every day. I want to help my team make the playoffs. We're in a good spot right now to make the playoffs, but I understand if they want to give me two days per week off that's good because they want me to rest a little bit and get better. But I'll talk to skip and try to tell him I'm ready to play, I'm ready to work." Roman Quinn was out of Sunday's lineup after tweaking his left hamstring Saturday. Quinn believes the injury is minor and expects to be out of the lineup for just a day. But his injury history will force the Phillies to stress caution. … Hector Neris struck out three of the four batters he faced in the seventh inning. He has struck out 14 of the 22 batters he's faced since returning from triple A. "He has a ton of confidence," Kapler said. … Seranthony Dominguez, a day after a rough outing, was pushed back into action in the ninth inning. He retired each of the three batters he faced to protect a five-run lead. "What we found was a perfect opportunity to get Seranthony back in the game. Create some confidence for him. He went out there and dominated. He made us feel like he's ready to go back into a big spot," Kapler said. … Zach Eflin will start the series opener Monday against Stephen Strasburg and the Nationals.